Despite the presence of over 300,000 streetlamps in at least 30 distinct designs, few of the millions who visit Manhattan’s bustling streets every year take note of these integral pieces of city life. The lights have not, however, completely escaped notice: this design drawing by Donald Deskey, one of the most influential Industrial Designers of his era, represents one of many official attempts at standardization. While studying in Paris, Deskey, then trained as a painter, attended the 1925 Exposition Internationale des Arts Decoratifs. Inspired by this celebration of Modernism, he returned to the U.S. and quickly switched gears, designing furniture and other accessories in industrial materials. Commercial success allowed Deskey to open his own firm, where he created iconic packaging for major American companies; his logos for Tide Detergent and JIF peanut butter, as well as his design for the Crest Toothpaste tube, are still used today. In 1958, the N.Y.C Department of Water Supply, Gas and Electricity commissioned Donald Deskey Associates to replace the 64 competing styles of streetlights in use at the time.1 Deskey worked with Alexander Lurkis, Chief Engineer of the Bureau of Gas and Electricity, to develop a new multipurpose light that would serve the many municipal needs of the growing city while both withstanding the elements and harmonizing with contemporary architecture. The resulting design, the Type 10 Light Pole, is a streamlined streetlight made of extruded aluminum, a lightweight, inexpensive modern material known for its strength and durability; it was also used in the construction of the International Space Station. Made of two interlocking pieces, the pole, featuring a new cobra-head luminaire designed by General Electric, could be adjusted both vertically and horizontally, and was easily mass-produced. Deskey’s firm designed multiple add-ons, allowing the humble streetlight to perform the many different functions required by the city. 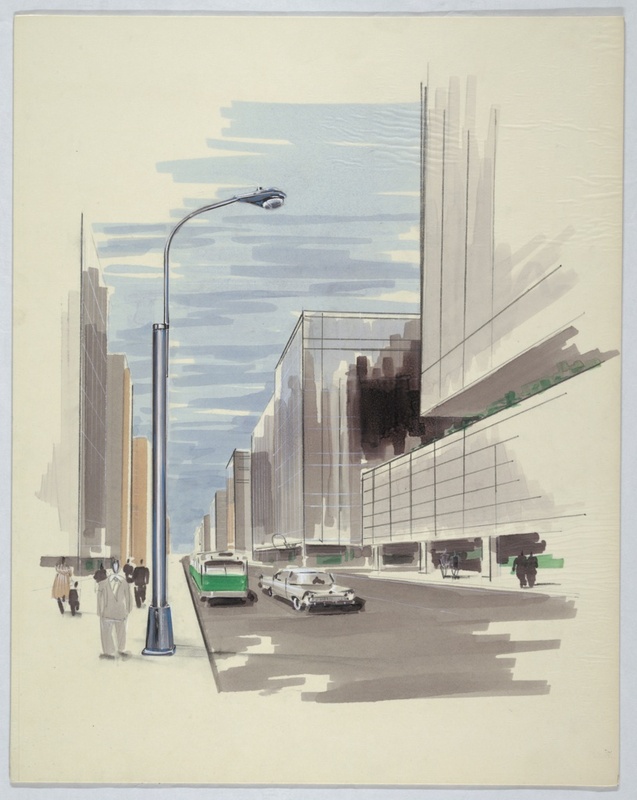 This presentation drawing is the final stage of Deskey and Lurkis’ design: the fully realized street lamp elegantly curves over an idealized Mid-Century street scene. Loose strokes of watercolor and gouache highlight the reflective glass and clean lines of Manhattan’s new Modernist architecture, while drawing the eye to the highly detailed rendering of the metallic streetlight, which seamlessly blends into its environment. Jutting into the blue sky and dwarfing the sketchy figures of pedestrians, it is almost a skyscraper in its own right. 1 Christopher Gray, “Should the City’s Streetlights Be All the Same or Different?,” The New York Times (New York, NY), Sept. 19, 2004. Ria Murray is a graduate student in the History of Design and Curatorial Studies program at the Cooper Hewitt, and is a Master’s Fellow in the Drawings, Prints and Graphic Design Department.